Disneyland is one of our favorite places to be so we were thrilled to stay in the Disneyland Hotel for a night on our recent trip! We hadn’t stayed there for quite some time so were excited to see all of the magical things that the Disneyland Hotel has to offer. The hotel had undergone a complete refurbishment since our last visit. 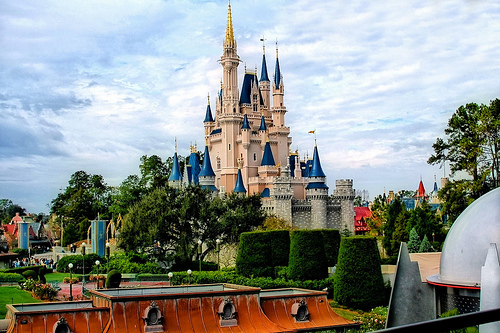 It is the largest of all the Disneyland hotels with 990 rooms (including 60 suites). 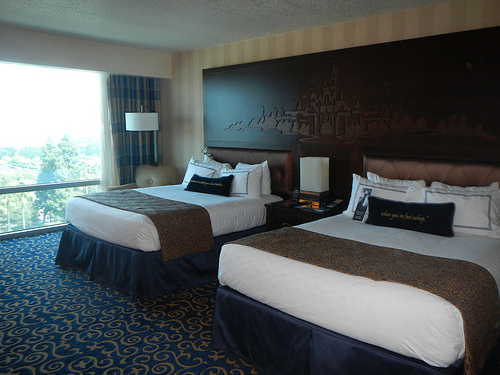 The Disneyland Hotel rooms are very spacious at 364 to 415 square feet. Much larger than most standard hotel rooms. The location is truly excellent. You are within very easy walking distance of the main entrances to both Disneyland and Disney California Adventure Park. You also have access to the resort guests only entrance to California Adventure park, which is extremely useful and reduces time standing in line to get into the park. 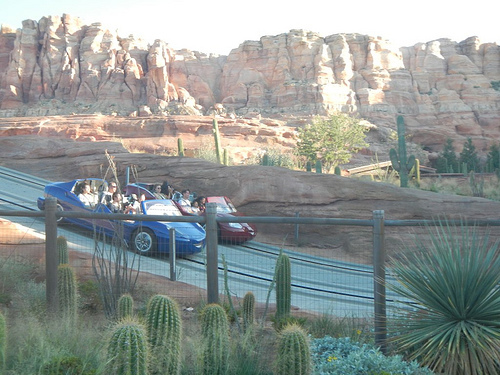 It is also very convenient if you want to get to the new Cars Land early in the morning! 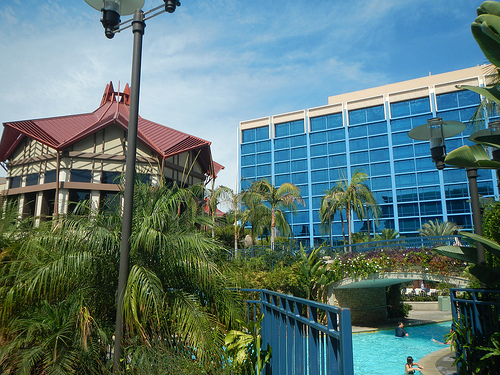 Downtown Disney is on your doorstep – although sheltered enough to not be too close. Downtown Disney has fabulous shopping and restaurants. You can also quickly walk to the monorail stop which gives you speedy access to Tomorrowland in Disneyland. The location of the Disneyland Hotel really could not be any better. You are in the center of all the magic but in your own peaceful resort! 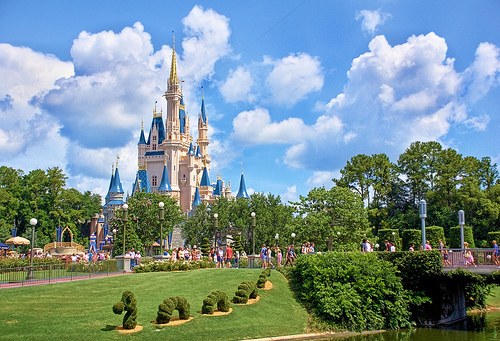 A visit to the parks can be tiring, particularly for families, but if you stay in a Disney resort hotel you can easily get back to your room for a short rest so that you can gather up all your energy to go back into the parks later in the afternoon. The standard of service is always very high at a Disney hotel – and this one certainly did not disappoint. Check in was quick and easy, and the Cast Member was very cheerful and helpful. We stayed in the Fantasy Tower and were very happy with the location as it is close to everything – the lobby, the shop and the resort pool. What we liked about the lobby was that as well as being spacious and modern it also has lots of photos of Walt Disney and Disneyland when it was being built. It is wonderful to be reminded of that connection – none of this amazing place would be here without him. One change I certainly loved is that internet service is now free in all Disney resort hotels. This makes such a difference to me and I wish that all hotels offered this. The Disneyland hotel does still charge for parking though – at $15 a day for self park. Our Disneyland Hotel room was perfect for our family of 5. Plenty of room to spread out, with 2 Queen beds and a twin day bed. There are also some King bed rooms available. The bathroom is a very good design with the toilet separate from the sink and shower. The decor is very stylish, comfortable and it also has some very special Disney touches. The overall color scheme is beautiful with dark woods and deep blue accents. All of the fixtures and fittings are very high end, and the bedding and beds were very comfortable. 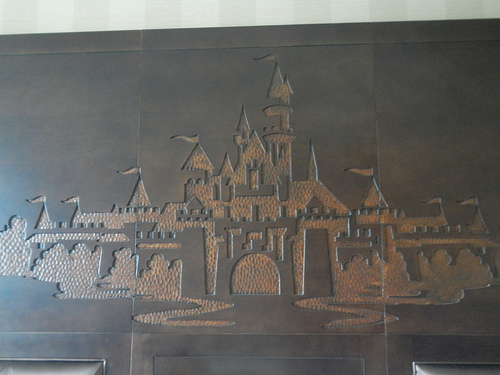 Our favorite part of the room was the carving of the Sleeping Beauty Castle in the headboard. The headboard comes to life at the touch of a button – a lighting display and music play depicting the Disney castle fireworks! 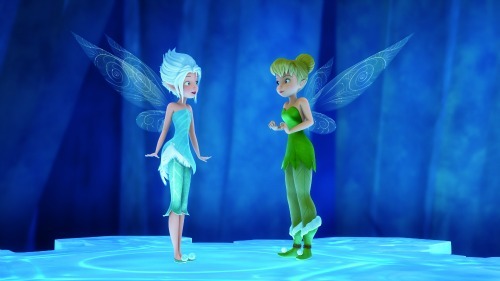 Truly a very special touch which is pure Disney. We also had a spectacular view of the fireworks from our room! 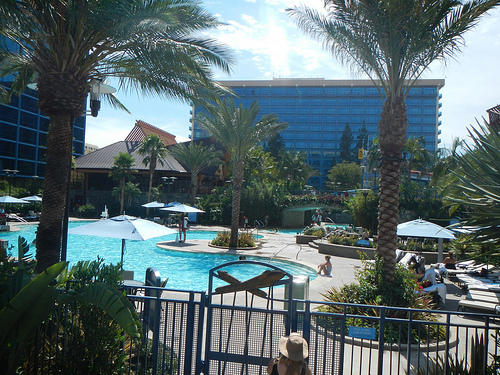 When you stay at the Disneyland Hotel make sure that you put aside some time to spend at the huge pool complex. We know that the parks will be your priority but the pools are so much fun for the kids, and very relaxing for the adults! 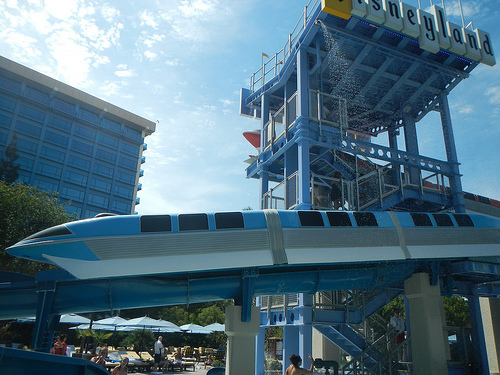 The new Monorail Pool has not just one, but two watersides! The E Ticket and the D Ticket Pools are newly refurbished and have plenty of rooms for the kids to swim and splash, and lots of sun loungers for the grown ups. There are also pool side cabanas available for an extra charge. To relax after a long day in the parks there are the hot tubs – they really do help with tired feet! The Disneyland Hotel is home to Goofy’s Kitchen which hosts a very popular character breakfast, lunch and dinner buffet. We didn’t visit this time but have enjoyed this many times before. The food is great and they are always so good with our special dietary requests (with vegetarian, gluten free and vegan family members)! The characters are great and spend a lot of time with the children. We had breakfast in the Tangaroa Terrace restaurant (which also serves lunch and dinner). We all enjoyed the new menu here and the ease of ordering from the touch screen. The location is great, just a few steps from the resort pool. The staff were very helpful and we enjoyed a very relaxed, and reasonably priced breakfast. Breakfast entrees are priced around the $6.99 for adults and $5.99 for kids range. One of the most highly acclaimed restaurants in the Disneyland resort is Steakhouse 55. It is more formal than many restaurants in the parks and resorts but this is Disney and you will still feel fine taking your kids there. Steakhouse 55 is known of course for it’s excellent steaks but anyone who enjoys seafood will also be very happy to dine there. Trader Sam’s Enchanted Tikki Bar is also an excellent place to dine. Look out for their great cocktails and try the Trader Sam’s Dessert Flight if you have a sweet tooth! The Coffee House is also a great place for a quick snack and a beverage. A good place to grab a cup of coffee in the morning before heading out to the parks. This is a huge benefit to staying in a Disneyland resort hotel. 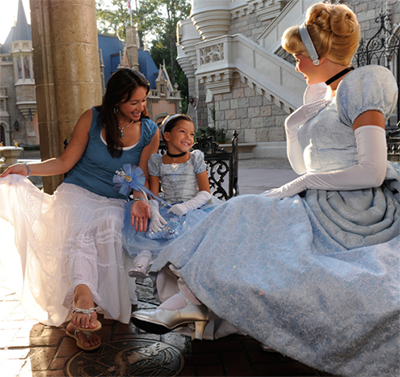 Guests of the Disneyland resorts can enter the parks an hour earlier than the general public on select days. The days and this benefit is subject to change, but right now guests can enter Disneyland up to an hour early on Sundays, Tuesdays, Thursdays and Saturdays and enter Disney California Adventure park early on Mondays, Wednesdays and Fridays. This Extra Magic Hour made a big difference to our stay. My boys were very keen to see the Cars Land attractions, particularly Radiator Springs Racers. We used the Extra Magic Hour and got to ride on Radiator Springs 3 times before the park opened to the general public! As soon as it did the wait times were up to 60 minutes (and then later in the morning up to 120 minutes). So this was a huge benefit! 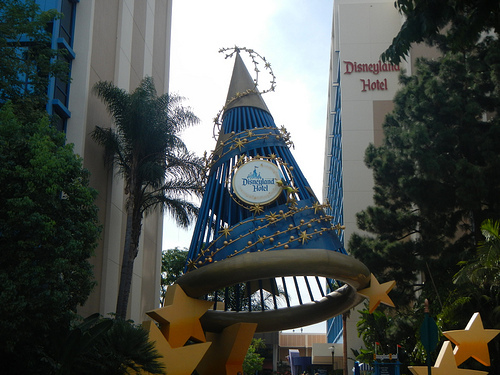 We had an amazing stay at the Disneyland Hotel and can’t wait to return! Disclaimer: Disneyland Hotel provided me with a one night stay to facilitate my review. My thoughts and opinions as always remain my own! 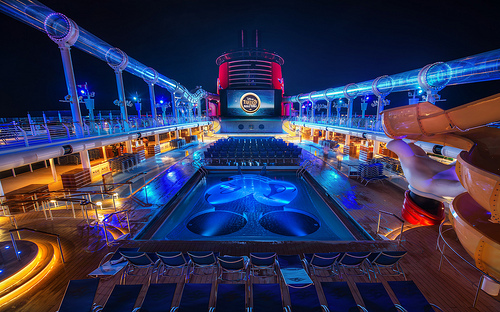 Want to win a 7 night Disney cruise to the Caribbean courtesy of Sunsweeps? 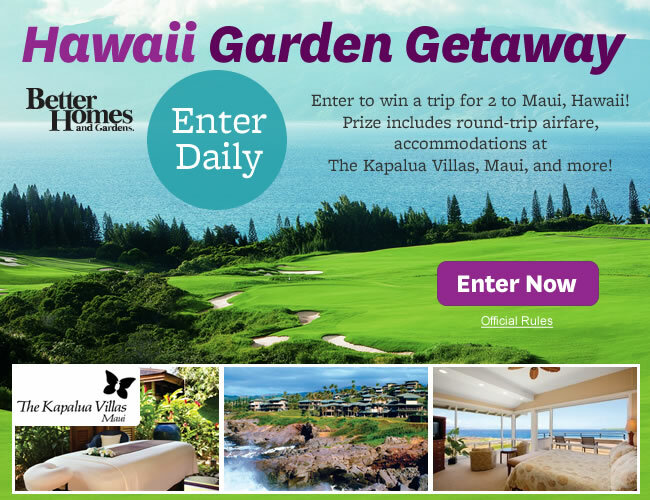 One Grand Prize Winner will receive a 7-day Caribbean Cruise for two passengers aboard Disney Cruise Lines. 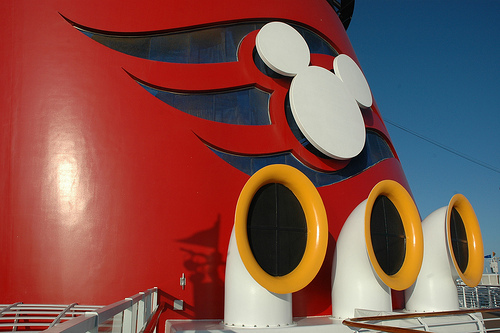 Imagine sailing on the Caribbean to wonderful locations including Disney’s private island Castaway Cay! 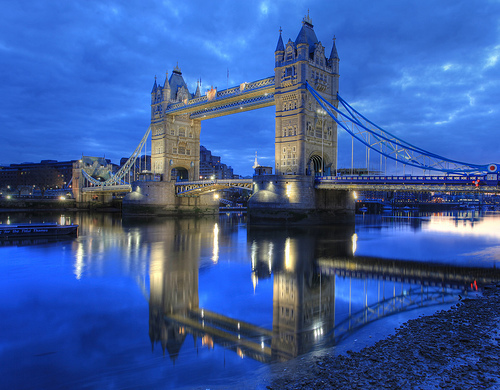 The amazing photo is courtesy of Trey at StuckInCustoms.com – one of the very best travel photography sites we have ever seen. 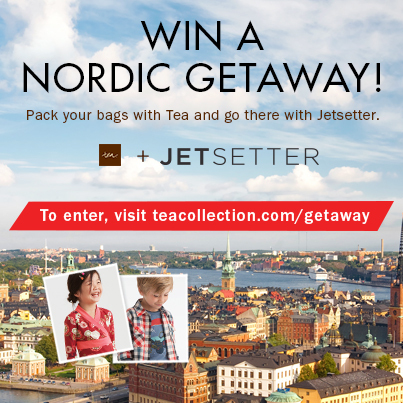 Head on over to the site to see some breathtaking travel photos.